After a post-merger transitional year, Radius Housing entered 2019 equipped with a new five-year corporate strategy to further its aim of making a positive difference in Northern Ireland by providing the best possible housing, care and support while building neighbourhoods and empowering communities. 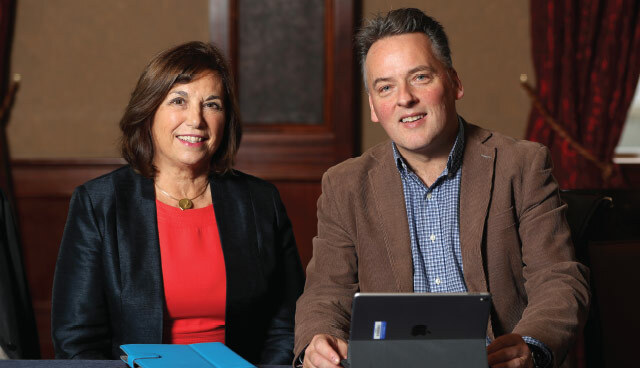 Odrán Waldron met with Chairperson Diana Fitzsimons and Chief Executive John McLean to discuss Radius’s plans for its 33,000 customers as well as its ambitious future development plans. In opening, Diana Fitzsimons sets out her vision for the housing association: “On our housing side of the business our focus has been primarily on providing a decent home for people who need one,” she says from Radius’s head office on the Lisburn Road in Belfast. “Increasingly we have sought to create well designed neighbourhoods for people to live in, with all the facilities necessary for a healthy life, and to help support the development of communities. A good neighbourhood includes a mix of house types and tenures, open spaces, children’s play areas, facilities to walk and cycle, community facilities, possibly small shops and services, and ideally some employment uses easily accessible to our tenants. “This is our plan for the large Visteon regeneration site near the M1 motorway in Belfast which will provide 244 homes, some social rented, some co-owned and some private for sale, plus open spaces and a community centre and will also facilitate 60,000sq ft of employment uses. We created a Community Investment Team with the purpose of supporting tenants and creating sustainable communities.” In Visteon and at other new developments, they have been liaising with local schools, churches and other local community groups to make sure in-coming tenants and home owners feel part of their new surroundings. Fitzsimons mentions the hubs in Radius’s larger housing schemes that provide practical support, advice clinics, childminding and other interventions for tenants. “We introduced a pilot financial support scheme with a Credit Union in the north west, to give tenants a real alternative to door step lenders. Signposting towards training and employment opportunities has taken on a new dimension following the inception of welfare reform where a steady livelihood can allow residents to feel they can be more active participants in their community.” Radius’s Community Investment Team also ensures that apprenticeships and placement opportunities are not only made available but are also worthwhile, both within Radius and its supplier companies. Another example of a recent community initiative is Radius’s role in the Housing Associations Integration Project (HAIP), a €1.1 million cross-border initiative aimed at promoting good relations across housing associations in Northern Ireland and within border regions, funded by the EU’s Peace IV Programme. Over 1,000 residents from 40 neighbourhoods have taken part in the initiative since its launch in 2018. Radius currently operates five schemes under the ‘Together: Building a United Community’ (TBUC) programme, with tenants from both sides of the community and overseas. There are a variety of activities arranged by Radius’s housing staff to build good relations. McLean says that the five schemes have been a success and Radius has been told of neighbours sharing equipment and supporting each other with children at school. Something, he says, has “knitted together those communities that would otherwise have been thrown in quite cold together”. Radius is also keen to promote mixed-tenure schemes, blending private home owners and social housing renters together, along with those in shared equity schemes where they part rent and part buy a home. McLean says that the key to attracting buyers and lowering the stigma of social housing is in good design: “It shouldn’t be that when one drives by a site, one can say ‘that’s a social housing development’. Social housing should be indistinguishable from the private housing”. What McLean calls the new world of welfare reform is a world where almost three in every four social housing tenants who are transitioning from benefits to universal credit are not able to pay their rent on time. He welcomes the freeze on the further rollout of the programme. “Universal credit is demonstrably affecting tenants in the period of transition between benefits and universal credit. Indeed 73 per cent of tenants on universal credit are in arrears, compared with about 24 per cent of those on traditional benefits. As an organisation, we would really call on a rethink of universal credit and more support for tenants in any period of transition,” he says. “It’s important we don’t forget that even a minor change in a person’s circumstance will result in an automatic transition to universal credit.” McLean also supports an extension to the mitigation of bedroom tax, saying that the change will cost Radius and the sector many millions of pounds in lost revenue if tenants cannot pay. McLean points to the added impact of Brexit on the most vulnerable: “Regardless of whether we have a hard or soft Brexit, our tenants are being impacted.” From a starting point where Northern Ireland already had the highest levels of fuel poverty in the UK, energy, fuel and food prices have jumped significantly in the last 12 months. Their financial hardship is only compounded by welfare reforms. “In the past Stormont has served the interests of local vulnerable people well with parties working together to support them and we managed to secure sensible but vital changes to welfare reforms,” McLean says. “However, in the current political vacuum there is great uncertainty”. Radius came into being following the merger of Fold and Helm Housing Associations, a process that Fitzsimons has said “has progressed particularly well” under the astute leadership of the CEO. She also credits the work done by the senior team prior to the merger, with the support of the board. That work in planning people and systems changes meant that employees were “ready for day one in April 2017” to continue service to tenants and those customers on the care side of the business. A considerable amount of consulting was undertaken pre-merger – with customers, stakeholders and employees – as some people do not adapt well to change and needed to be brought on board with the new possibilities and the new vision. “We’ve devised a strategy that is about creating a new culture and a new business,” Fitzsimons says, “under the guidance of a combined then refreshed board”. Radius recently recruited six new board members in open competition and has taken on an ‘apprentice’ board member for the first time as part of her course. Aside from board restructuring, Radius has integrated staff and modernised their terms and conditions, integrated systems, drafted a new suite of policies, developed its Community Investment Programme and introduced new working practices including mobile working. Talking about Radius means talking about the future of social housing and Fitzsimons, a planner by profession, is excited about a future that includes the regeneration of a number of mixed-use schemes and the rebranding of the company’s 24-hour telecare service, now named Radius Connect 24. This is “the backbone of the care and support side of the business” that serves Radius’s own tenants and residents and those of other affiliated housing organisations. The next five years, covered by the company’s five-year corporate plan, includes the challenging goal of building 2,000 new units. “Last year , we had a very successful year delivering over 500 units on the ground,” McLean reveals. 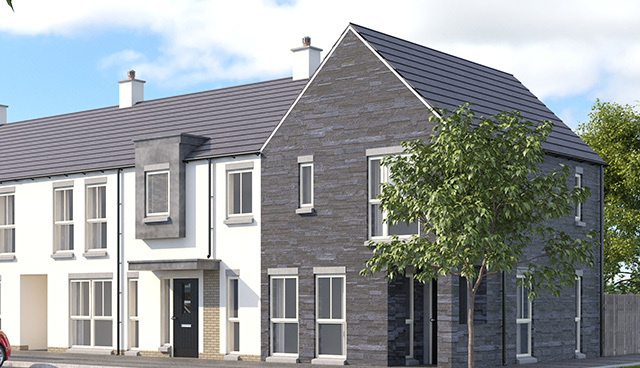 These proposed 2,000 units include the 244 progressing at Visteon, as well as mixed-use and mixed-tenure sites at Hope Street in Belfast and the former St. Patrick’s Barracks site in Ballymena, projects that could yield up to 450 new homes. A Radius private subsidiary, Tealstone, has been set up to develop the private housing side of the business mainly in mixed tenure schemes. With housing sites becoming scarcer, land values rising and planning processes becoming more complicated, Fitzsimons calls on Northern Ireland’s councils to “bring forward Local Development Plans which not only encourage mixed tenure, but actively encourage sustainable communities with a shared ethos where people of all backgrounds can live together in mutual respect”. “It is a people-led approach across all parts of Radius, from tenants to staff, that allows us to effectively do the work with which we have been tasked,” McLean explains. “The key to unlocking and achieving all our goals is to empower and enable our staff to use all their creativity to make a difference,” he concludes. Diana Fitzsimons was chair of Fold Housing Association for four years and has been chair of Radius Housing since its inception following the merger of Fold and Helm Housing Associations. She holds an MA in Economics from Trinity College Dublin and an MSc in Town Planning from QUB. She is a Fellow of both the Royal Town Planning Institute and the Royal Institution of Chartered Surveyors. She has worked as a planning officer for government; as a Senior Lecturer in planning at Ulster University; as a Principal Commissioner with the Planning Appeals Commission; as an English Planning Inspector; and as a planning consultant serving as Office Director with the UK consultancy Turley Associates. She lives in Jordanstown and is currently a Belfast Harbour Commissioner, Visiting Professor at UU, a Council member of the International Federation for Housing and Planning and mother of four grown up sons. Her interests outside of work include family and foreign travel. John McLean was appointed Chief Executive of Fold Housing Association in June 2005 and has served as Chief Executive of Radius Housing since Fold’s merger with Helm. He is also Chief Executive of Fold Ireland, an approved housing body based in Dublin. He has just completed four years as Vice Chair of the NI Federation of Housing and remains a board member with them. John is a chartered engineer and a graduate of Queens and Ulster Universities and BIFHE. He previously held commercial director posts with NIE, the Tyco Group and the Rotary Group. He has worked in manufacturing and contracting sectors, overseas and in the UK. John was awarded an OBE in 2016 for his services to the local social housing sector.